I'm passing this AWARD...a truly heartfelt one to someone who has been very nice to me in the blogosphere. In fact, she had been there for me, patiently answering questions when I was too busy to delve into the nitty-gritty involved in monetizing my blog. AND! She got me jumpstarted after being up the wall for a long time stuck without opps just because I didn't put some info right! Yes I remember. That's why I'll always be grateful to you!!! Teacher Juliana of PINAYWAHM and TEACHER'S CORNER. I just realized you already have this! But it's yours to keep anyway so please accept it! HAHAHA. You make my day! Elow Ms. Miracle worker! 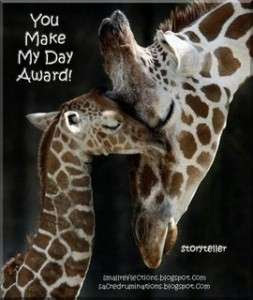 You make my day too! hehehe. Sana nga totoong miracle worker ka. Sige, see ya around sa blogosphere. Bloghopping nalang ako at wala akong ma-post bwahahah. you make my day too. clarisse is right J... you're one of the angels hovering around the blogosphere. thanks for keeping watch... ciao!